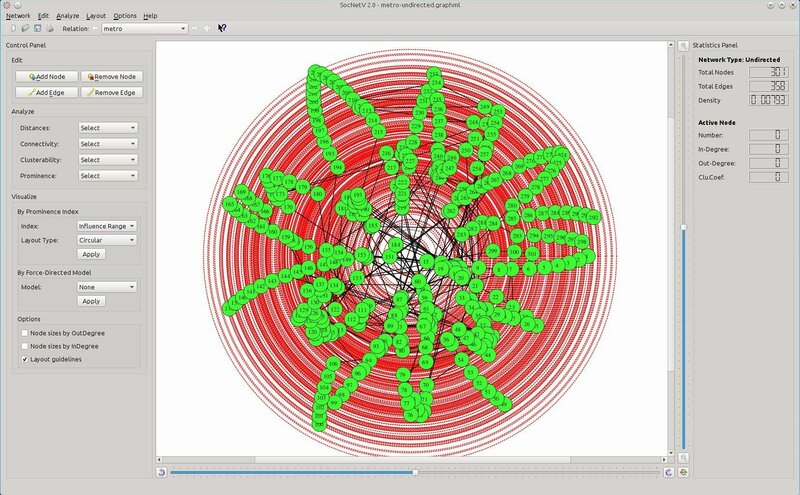 Social Network Visualizer (SocNetV) is a cross-platform, user-friendly software for social network analysis and visualization. 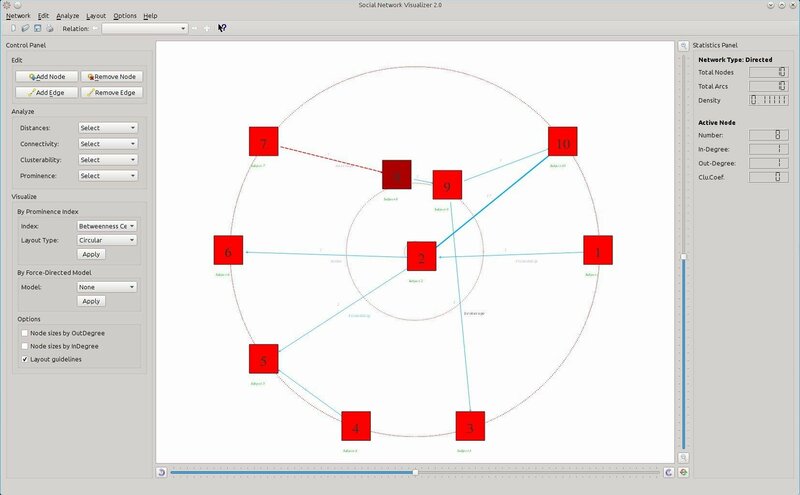 Social Networks are displayed and analyzed as mathematical graphs, where vertices depict actors/agents and edges represent their relations. 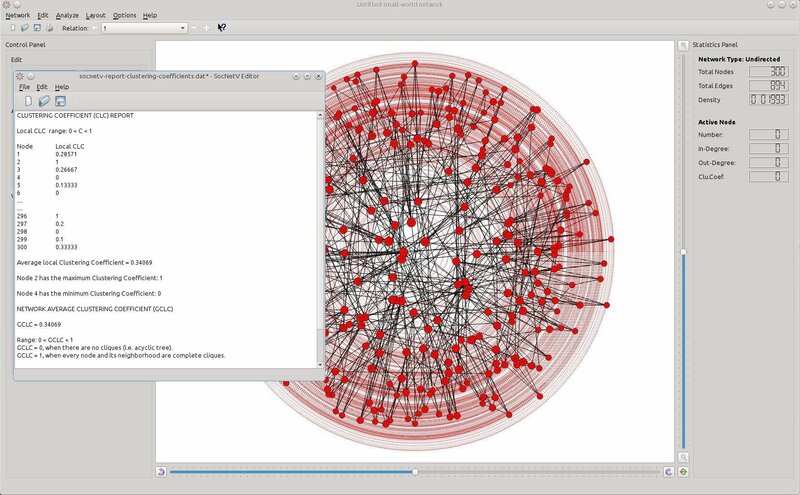 With SocNetV you can draw social networks with a few clicks on a virtual canvas or load field data from various social network formats supported such as GraphML, GraphViz, Adjacency, Pajek, UCINET, etc. 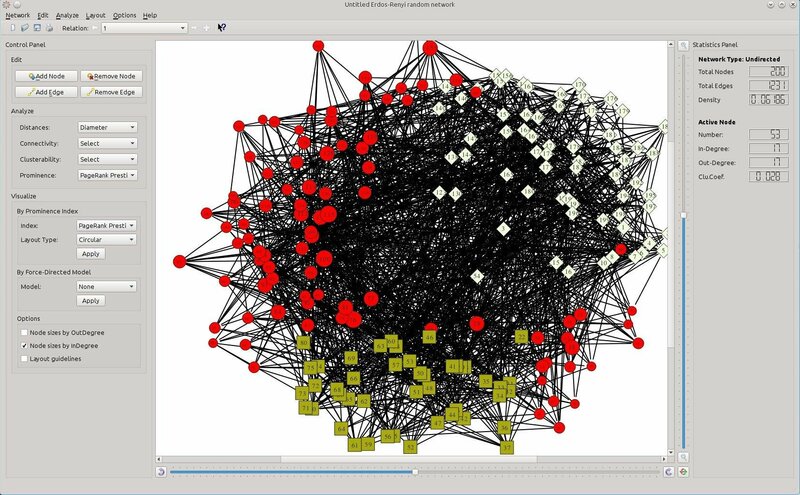 Furthermore, you can create random networks using various random network generation models (Barabási–Albert Scale-Free, Erdős–Rényi, Watts-Strogatz Small-World, d-regular, ring lattice, etc) or recreate famous social network analysis datasets, i.e. Padgett's Florentine families. A simple web crawler is also included to automatically create "social networks" from links found in a given initial URL. The crawler scans the given web page for links and visualizes the network of all webpages/sites linked from it. SocNetV enables you to edit your social network data through point-and-click, analyse their social and mathematical properties, produce reports for these properties and embed visualization layouts for relevant presentation of each network. It also supports multirelational loading and editing. You can load a social network consisting of multiple relations or create a social network on your own and add multiple relations to it. The application supports various layout algorithms based either on prominence indices (i.e. circular, level and nodal sizes by centrality score) or on force-directed models (i.e. Eades Spring Embedder, Fruchterman-Reingold, etc) for meaningful visualizations of the social networks. * New Feature: Kamada-Kawai layout model. where every two actors are 'particles' mutually connected by a 'spring'. * New Feature: Node colors by prominence score visualization layout. 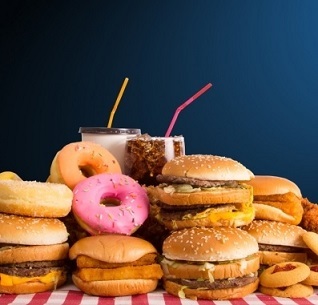 is inside the network in terms of Centrality or Prestige. are used according to the prominence score of each node. * New behavior: Reciprocated edges in directed networks appear in a single line. weights of both arcs. If you right-click a reciprocated edge and select "Remove edge"
to remove/change, for instance "A --> B" or "B --> A". * Improved memory consumption during user interaction with large networks. memory consumption in those cases. * New options and features in web crawler. Web crawler dialog and algorithm has been enhanced with nice new options and features. The user may now specify certain link patterns to include or avoid during parsing a web page. edge in a directed network, the Statistics panel displays the weights of both edge directions. * Added Performance options in Settings dialog. New Performance options have been added in app Settings dialog (Canvas tab). 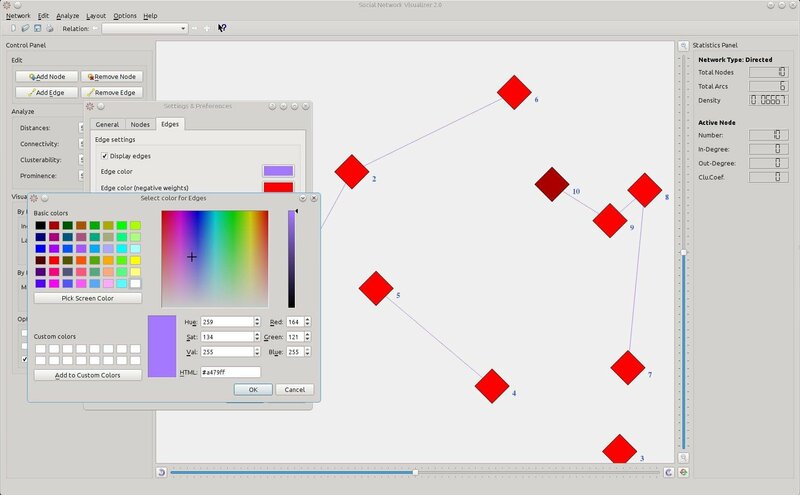 The user may now select which features of the Qt GraphicsView will be enabled. will give a performance boost and make the interaction with the network quicker. Also, if you need max performance, we recommend disabling all checkboxes. * Improved UCINET format support (fullmatrix two-mode and edgelist). of NR actors and NC organizations. Work will be done in future versions to let the user select if she wants one-mode or two-mode data visualization. consists of a total of NR+NC nodes. For each non-zero (i,j) element of the fullmatrix, an edge from actor i to organization j is created. exported from R's sna package. * Improved "Check for updates" procedure. compare it with the version it runs and inform the user if an updated version is available. In future versions, we might have this routine to run on load. Many bugs have been fixed and random crashes were resolved. See fixed bugs below for more. #47: Extra columns displayed in Adjacency Matrix report when the user has disabled nodes. 1,097 6,569 Dimitris V. Kalamaras <img src="https://www.oldergeeks.com/downloads/gallery/thumbs/Social Network Visualizer1_th.png"border="0"> Nov 12, 2018 - 12:54 2.4 18.84MB ZIP , out of 20 Votes.